Headquarters of German luxury car maker BMW in Munich, southern Germany. BMW and Mazda lead the way in cutting auto emissions, well ahead of their rivals in the hunt for cleaner cars as new European Union targets begin to bear green fruit, a report showed Tuesday. BMW and Mazda lead the way in cutting auto emissions, well ahead of their rivals in the hunt for cleaner cars as new European Union targets begin to bear green fruit, a report showed Tuesday. Taking cars made by 14 major automakers into account, the average CO2 fall per car was put at 3.3 percent, the European Federation for Transport and Environment said. 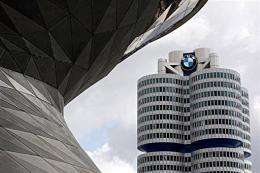 German automaker BMW achieved the best results in 2008, with CO2 down by an average 10.2 percent, according to the results of the group's survey. Japanese maker Mazda cut its car emissions by 8.2 percent over the same period, the transnational industry group said, stressing that the figures reflect cuts in emissions, which is easier for higher polluters to do than their cleaner rivals. Nevertheless the 3.3 percent emissions drop in 2008, measured across 14 major car makers, shows that new EU rules on emissions are having an effect, said federation director Jos Dings. "If the overall drop in average CO2 emissions was purely related to the financial crisis, fuel prices or changing consumer behaviour, we would have expected to see every company reducing much more equally," he said. "But what is actually happening is that carmakers are seeing how far they have to cut and changing their fleets accordingly," he added. Thus Ford sold off its gas guzzling Jaguar and Land Rover brands. That move accounted for more than half of the US car giant's 6.7 percent emissions reduction, the federation said. By contrast the Volkswagen group, together with Japanese hybrid manufacturers Toyota and Honda made "relatively poor progress" because they continue to offer the most fuel efficient technologies as an option rather than across the range. The BMW group, which recorded the biggest improvement in emissions for the second year running, offers its 'Efficient Dynamics' technologies across its entire product range. Progress slowed dramatically at Fiat and Peugeot-Citroen which already have Europe's cleanest fleets and are close to meeting their EU targets. Last year European Union nations agreed that automakers will have to reduce CO2 emissions from new cars to 130 grams per kilometre (0.6 miles) over the period 2012-2015, from an average of 150 grams at present. Automakers could be fined 95 euros for every single vehicle that breaches those targets. On that scale, BMW and Mazda fare far worse, with the German manufacturers cars emitting 154 grams per kilogram and its Japanese rival 158 grams. Higher still on the scale were Volkswagen, Nissan and Daimler, the latter topping the polluting list at an average of 175 grams.